Dahlias fell out of fashion but now even the poshest gardeners realise they can’t be beaten for flowers and colour. Even old-fashioned chrysanthemums have managed a revival, their jewel-hued blooms becoming the darlings of the new wave of cut-flower growers. So what’s next on the list for a comeback? The smart money’s on gladioli. Good old glads are seen by many as the preserve of allotment owners who grow military ranks of upright spikes. If you like those large, colourful spikes you’ll be pleased to know that they’re actually very easy to grow, particularly if your soil is light and free-draining. The plump corms are planted in mid to late spring and soon thrust up sword-like leaves. These are followed by a flower spike that will probably need staking to keep it straight. And that’s really all there is to it. Cut the spikes when the bottom few florets are just opening and the rest will bloom when they are in a vase. 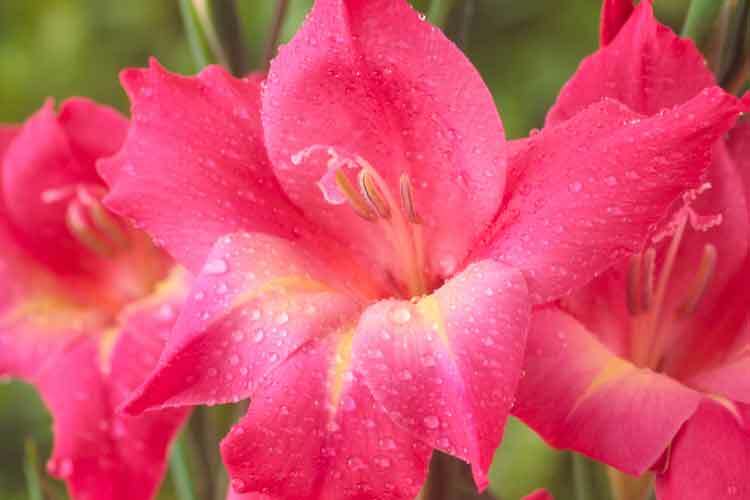 These large cut-flower glads can be quite hard to weave seamlessly into your borders, but there are smaller-flowered, daintier varieties such as the primulinus and tubergenii types that look a treat teamed with other plants. Varieties such as ‘Charm’ have sprays of vivid bubblegum pink flowers while pure white ‘The Bride’ is a classic choice, equally at home in pots. These gladioli are tender so once flowering has finished and the leaves are turning yellow, you need to lift the corms, dry them off and keep them somewhere safe over winter. You’ll see that the corm that produced this year’s stem has shriveled and, above it, a fat new corm has formed. After a week or two, you’ll be able to snap the old one off, leaving the new one to keep for next year. You could avoid lifting by growing a hardy gladioli such as G. byzantinus, a wonderful magenta-pink. Mine come up each year among the mauve sprays of catmint – a lovely combination. Put grit below the corms when planting to prevent rotting. A vigorous, evergreen shrub with small, green leaves on arching stems. The pink flowers appear in late summer and continue into autumn. ’This variety has yellow leaves with green splashes. Shiny maroon stems bear colourful pink flowers with soft terracotta calyces.